Do you teach French or German as a foreign language and want to make these languages more attractive and accessible to your students or trainees? The Franco-German Youth Office (FGYO) supports you. 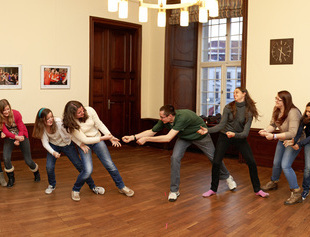 Linguistic education is one of the basic concerns of the FGYO: We encourage all young people in Germany, France and Europe to learn the languages of the neighboring countries. We support, in particular, the promotion of French and German as a foreign language and are pleased to offer various programs for language learning. The FGYO has developed several resources for language learning that you can use in your classroom or in extracurricular courses. Playful learning of languages and intercultural awareness from early childhood are key to developing foreign language skills and an open mind. The FGYO supports trilateral exchange programs with French and German schools, elementary schools and professional education facilities. This is particularly useful when the students have to select their first or second foreign language. However, staying in another country and culture is an excellent experience for all age groups.